12:55 Pacific: Still no sign of Gmail in the Apple iTunes store. Google posted Gmail for iOS with great fanfare — and, due to an error message on its opening, took it down. Bug fix? Google, so far, declines comment. 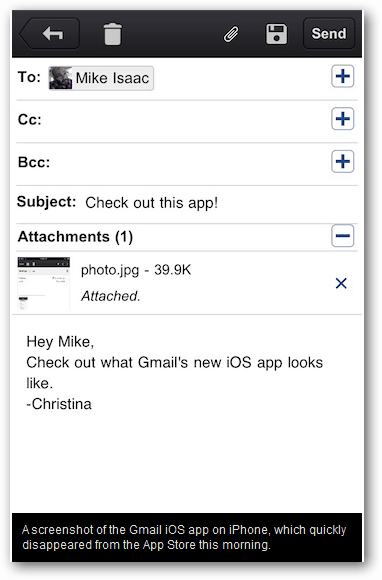 Update: 11/2/11: Earlier today we launched a new Gmail app for iOS. Unfortunately, it contained a bug which broke notifications and caused users to see an error message when first opening the app. We’ve removed the app while we correct the problem, and we’re working to bring you a new version soon. Everyone who’s already installed the app can continue to use it. For more on this continuing development, stay tuned to groovyPost.com.